Rogue Kettlebells begin as first run iron ore, not scrap, and are formed into a strong, balanced, single-piece casting with a flat wobble-free base. A clean, void-free surface and durable powder-coat finish give Rogue Kettlebells an unmatched feel. The Rogue Kettlebell was designed around these requirements. Premium Material: We started with the highest quality first run iron ore available, not scrap. Void free surface: We use a proprietary casting process so each bell can reach the highest quality and have the cleanest finish possible. This also allows us to have a smooth, comfortable handle. Single Piece Casting: The Rogue Kettlebell is cast in one solid piece, creating a stronger, more reliable handle and a void free surface. 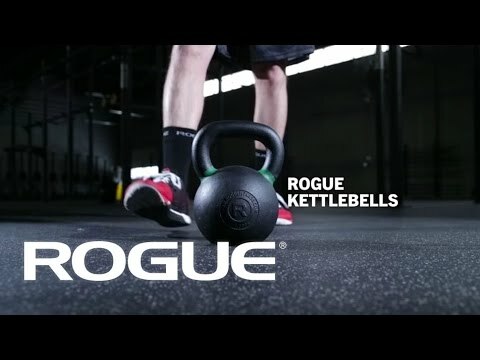 The Rogue Kettlebell does not use plastic caps, plugs, or patches like lower quality products. Wide Flat Machined Base: We chose to machine the base of our kettlebell flat (not leave it as a raw casting) so it sits perfectly on the floor and does not wobble. Finish: The Rogue Kettlebell has a matte black powder coat finish that has a great feel and will hold chalk. This feels more natural than a thick epoxy finish. Colors: We color coded the handles. By associating each kettlebell weight increment with a different color handle, it becomes much easier for gym owners and trainers to direct athletes to specific kettlebells on sight alone. Texture matters. A well formed, balanced, and properly textured kettlebell feels better in the hand and performs better in motion. Rogue Kettlebells are textured to hold chalk well, but have enough grip to be used without. The finish texture helps a Rogue Kettlebell feel comfortable in the hand or against the forearm in the rack position without being too rough. Whether you’re purchasing a single set of KBs for your garage gym or outfitting a large facility, Rogue Kettlebells are available in the weight increments you need—from lightweight beginner bells (starting at 9LB) to our Monster Bell Series (97LB and up). 9LB - 18LB - 1.2"
35LB - 88LB - 1.5"
97LB - 203LB - 1.58"
Rogue Kettlebells are manufactured from first run iron ore (not scrap, like many KBs on the market) and go through a single-piece, proprietary casting process. This creates a stronger, more reliable handle and a void-free surface. The Rogue Kettlebell does not use plastic caps, plugs, or patches like lower quality products. The base of each kettlebell is machined flat (rather than leaving it as a raw casting) so it sits perfectly on the floor and does not wobble. You can tell the difference as soon as you pick one up. Kettlebells work muscles you didn’t even know you had. A set of kettlebells, an AbMat, a pair of Rogue Wood Rings, and an SR-1 Speed Rope are a great way to start building out a garage gym. You can also check out our elite Competition KG Kettlebells, which feature uniform diameters and handle widths across every increment, from 8KG to 48KG. All of our kettlebells up to 88LB feature color-coded handles for easy recognition at a glance. All Rogue Kettlebells feature a matte black, powder coat finish. Powder coat is more durable and the texture feels more natural than an epoxy or painted finish. Rogue prides itself on fast, professional shipping, often with same-day turnaround times. Your kettlebells will be packaged safely and efficiently, and you’ll be able to follow the progress of your order from our factory floor to your door using the online Rogue Shipping Tracker. Please note, all KBs over 70LB in weight will ship freight. Rogue Kettlebells is rated 4.9 out of 5 by 309. Rated 5 out of 5 by GrantNH from Great Kettlebell I bought this and very happy I did. I look forward to increasing my collection of different kettlebell weights in the future. Rated 5 out of 5 by Siharrismon from Good equipment great service I got these 16kg kettlebells along with the 24,28 and 32kg ones. Arrived promptly; very well packaged, the heavir ones in three boxes filled with polystyrene. All arrived in perfect condition. As for the kettlebells themselves, they have large handles, easy to grip with both hands and remain undmamged from the minor knocks that I have subjected them to. Rated 5 out of 5 by Jared 27 from Great product Bought this a couple months ago, it is exactly add described. Fast shipping. Use it several times a week. Rated 5 out of 5 by Cash12 from Love it I do hardstyle and I am pretty particular about my kettlebells. So far so good. Rated 5 out of 5 by TheGreatChad from They dont get any better than this! The porosity of the cast iron is PERFECT! Looks smooth, but just gritty enough to hold chalk and your grip. Will definitely be adding more to my collection.